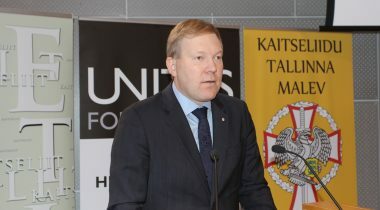 Speaking at the Higher National Defence Course at Roosta (Estonia) today, Chairman of the National Defence Committee of the Riigikogu (Parliament of Estonia) Marko Mihkelson said that Russia has started a game of power, essentially a hybrid war, against the West, and only NATO's strong common policy is of help against it. “The best defence league of the Western world NATO needs a serious political impetus to face two long-time threats: Russia’s revisionist and aggressive policy and the spreading of Islamic extremism,” Mihkelson said. In Mihkelson’s opinion, Russia’s and Iran’s open intervention in Syria’s civil war has made it an international conflict that can have a very far-reaching impact. “The common aim of Moscow and Tehran is to save the President of Syria al-Assad, and at the same time force the USA and other countries of the West to retreat in the Middle East,” Mihkelson spoke. In his opinion, Russia has repeatedly checked the reaction of the West with its aggressive steps during recent years. It has taken Russia to certain isolation because of the sanctions, but at least at the moment it seems to frighten nobody in the Kremlin. Speaking to the participants of the National Defence Course yesterday evening, Mihkelson pointed out that although the war in Ukraine is not yet history, it is Syria that has literally become the powder keg of international security. He saw danger in the aggressive activities of Russia’s air forces in Syria and also in the violation of the Turkish air space, which can both lead to unpredictable consequences. Mihkelson sees the danger that if bad circumstances coincide or a direct conflict with members of NATO arises, the situation in the Baltic region could also rapidly turn critical. “Moscow might make a miscalculation and rely on its seeming strategic superiority in the Baltic Sea region,” he said. Therefore the Chairman of the National Defence Committee thinks it is very important that our allies continued the establishing of deterrence capabilities in the Polish-Baltic region at a faster pace. The Higher National Defence Courses are held twice a year. Their purpose is to introduce the security, foreign and defence policy of Estonia, and the broad-based approach to national defence, and to increase cooperation and national cohesion in the field of national defence. The courses have taken place since 1999, and by today nearly 1700 persons have attended them.